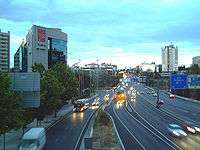 The Autovía A-2 (also called Autovia del Nordeste and Avenida de América) is a Spanish autovía and autopista route which starts in Madrid and ends in Barcelona. It replaces the former N-II. This article is issued from Wikipedia - version of the 5/23/2014. The text is available under the Creative Commons Attribution/Share Alike but additional terms may apply for the media files.